We found no surface water when we arrived at Harper’s Well (March 14th, 2012) . The water table was nine feet below the broken-off rim of the well casing. The water tested at a salinity of five parts/thousand, about equal to a teaspoon of salt in a quart of water or unpleasantly salty soup, not quite as salty as soy sauce. Despite the lack of surface water, we found dramatic evidence of the history and power of running water at that site. When Anza arrived at Cienega San Sebastian, the expedition spread out and investigated many wells, springs, and pools looking for the ones with the freshest water. While the main camp was probably a half-mile north on San Felipe Creek, the arroyo at Harper’s Well was certainly explored. 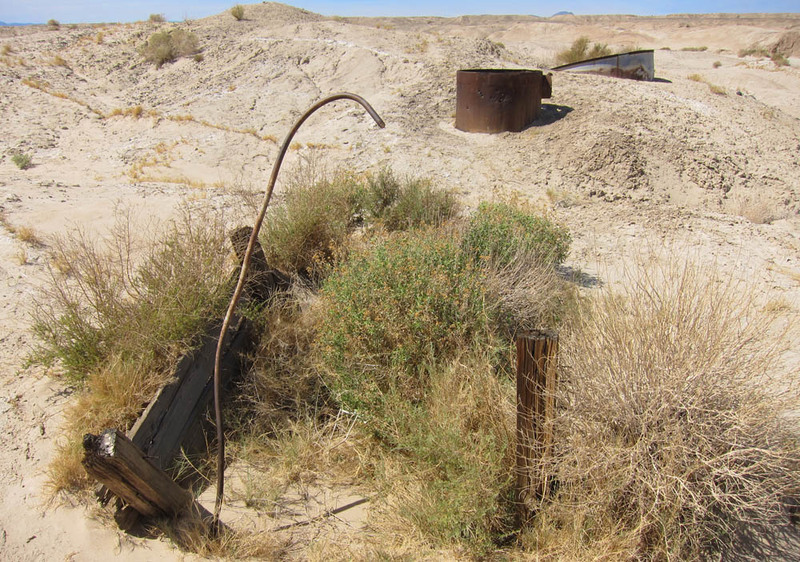 At Yuha Well, Anza’s crew dug wells, undoubtedly starting in the creek bed of the arroyo. Later, permanent wells were dug starting up the stream banks so that the wells would not fill with sand when water flowed in the arroyo. Likely the first wells at Harper’s Well were dug in the creek bed. Harper’s Well became an important water source for later immigrants, and a permanent well with an iron casing was drilled up in the bank of the arroyo. At Harper’s Well today, the arroyo has meandered, eroding away several feet of the bank. Twelve feet ten inches of well casing has been exposed and toppled, now lying on a sand bar. 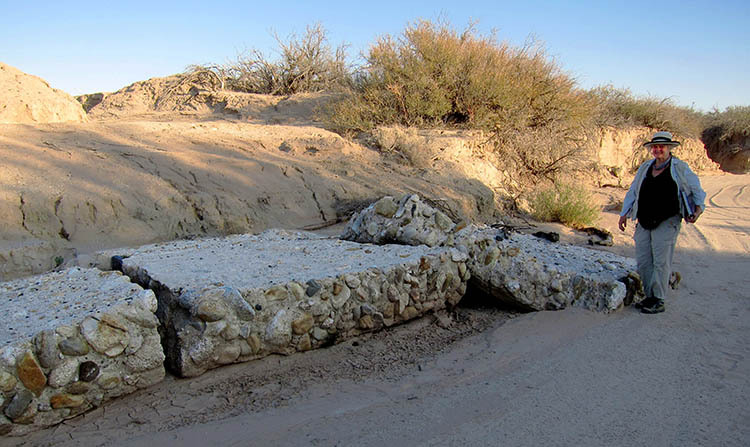 About 50 yards upstream, several segments of concrete wall lie toppled over on the stream bed. This animation shows stream-bank erosion and sand bar deposition between 2005 and 2008 at Harper’s Well. Click for a larger version in a QuickTime format. The animation begins with a 2005 image from Google Earth, locating the well and wall. When the arroyo does flow, the water runs from the south at the bottom of the picture towards the north at the top. The road appears as a dashed line, and then the low-flow stream channel is shown in magenta. Notice that at this point, the well is sticking up out of the low-flow channel. The background image then changes to a 2008 image. Between 2005 and 2008, massive downpours must have taken place, because the meander bend downstream of the well has eroded its way about 35′ to the northwest, as can be seen when the 2008 low-flow channel appears in red. As typically happens, a sand bar has built up on the bank opposite the greatest erosion. Finally the zone of greatest erosion is indicated in blue, and the area of sand bar deposition is indicated in green. Note that the sand bar has elevated the terrain immediately around the well casing, so the well is no longer in the low flow channel. We have not yet uncovered actual historic records of the site, but from what we have seen, one can readily infer the story. This area is the exposed bed of an ancient lake, a location of very low gradients (160 feet below sea level) in a terrain of minimally lithified, lake-bottom sediments. Rainfall is scarce, but often occurs in extreme downpours. In such situations streams can meander rapidly. This sequence of meandering and erosion of some stream banks balanced by deposition of sand bars on opposite banks continues through decades, centuries, and millennia. It appears that in the past when erosion first threatened the well, the wall was built upstream to protect the stream bank and the well. 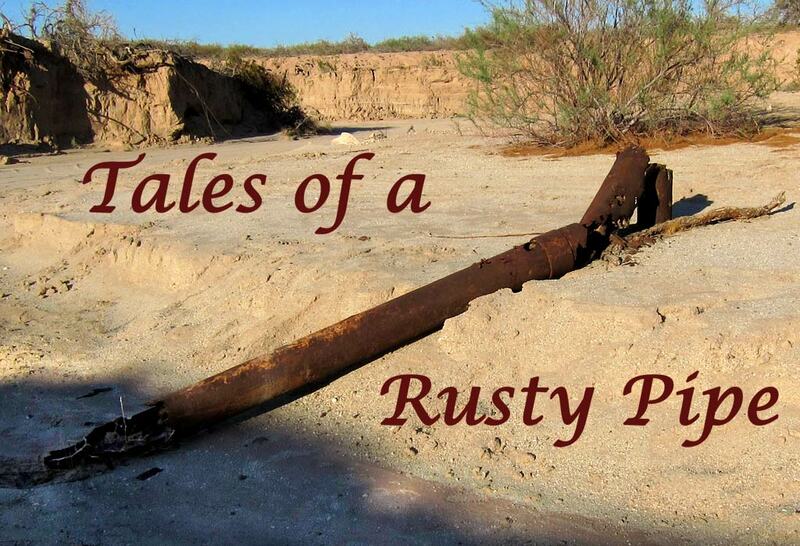 However, as they ultimately will, the natural processes of downpours, flooding, and stream dynamics overwhelmed the efforts to protect the bank, the wellhead was lost and at some point, the well casing stood up at least 12 feet out of the stream bed before toppling due to rust and perhaps human intervention. In gratitude, Anza named the site for the Indian Sebastian Taraval, nicknamed Peregrino (the wanderer), who successfully led them here to water. 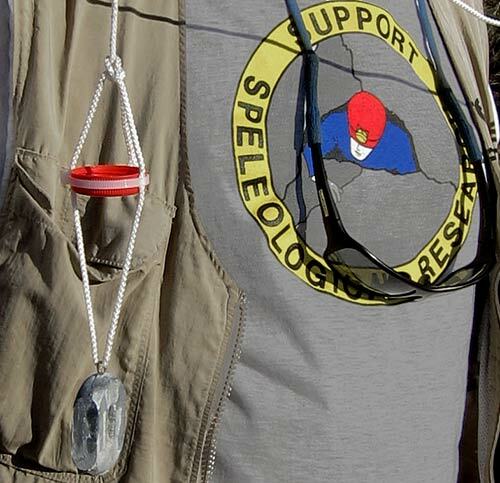 “To this site I gave the name of Zienega de San Sevastian, alias del Peregrino. In the place where we halted there is a good spring of very potable water, and there are many others to the west which are saline. From them is formed a marsh more than a league long with plentiful pasturage, although it is likewise salty.” –Juan Bautista de Anza, March 10, 1774; translated by Herbert Bolton, 1930; underlines ed. One of the themes of our research is linguistic. Much of the Spanish-language vocabulary used by the explorers and colonists included words with obsolete spelling conventions and words that do not have good English-language equivalents. The English language is a product of Northern Europe where there are wet summers and an old, stable, mature terrain. Spanish is a product of the Mediterranean and Northern Africa, which, like California, is summer dry, and has a tectonically active, young, immature terrain. It is not surprising that the Spanish vocabulary for aquatic features is better attuned to many features of California and the desert southwest than is the English vocabulary. This is a good opportunity to take a moment to look at how our preconceptions of both language and terrain have influenced our reconstructions of history and historical ecology. The Anza quote is a perfect example of the linguistic issues. The first issue is the simple issue: in modern Spanish, Zienega de San Sevastian becomes Ciénaga de San Sebastian. The second one is the real problem. Bolton, as others would have, translated Zienega as “marsh.” In our explorations of this fantastic ecosystem, a nagging question remained: where’s the marsh? Answer: Ciénaga does not translate into English; what we saw we would not call a vast marsh. A cienega or cienaga (in modern Spanish ciénaga) is a Spanish Colonial term for a spring, that is in use in English in the southwestern United States. A cienega usually is a wet, marshy area at the foot of a mountain, in a canyon, or on the edge of a grassland where groundwater bubbles to the surface. 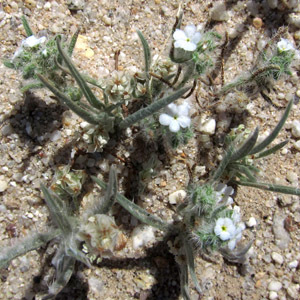 Often, a cienega does not drain into a stream, but evaporates, forming a small playa. Topographic Map of San Sebastian Marsh at the confluence of San Felipe and Carrizo Creeks. The author of this map was generous in his representation of the verdancy of the site. Click to enlarge. Then there are the preconceptions of terrain. In other regions of the West, Imperial and Coachella Valleys might have been a land of mesas and canyons, but here the collision of tectonic plates crushes the terrain, liberating a flood of gravels engulfing upturned sedimentary layers and thrusting up isolated mountain peaks. 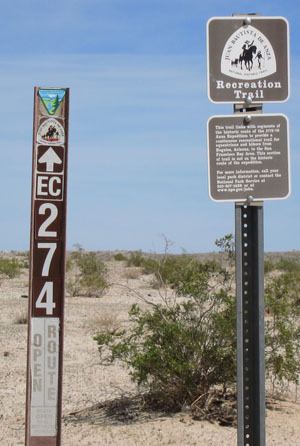 As you drive across the desert towards Arizona on I-8, I-10, or CA-78, mountains appear to pop up out of a sea of gravelly piedmont sparsely scattered with creosote bush and pockmarked with occasional stands of mesquite. 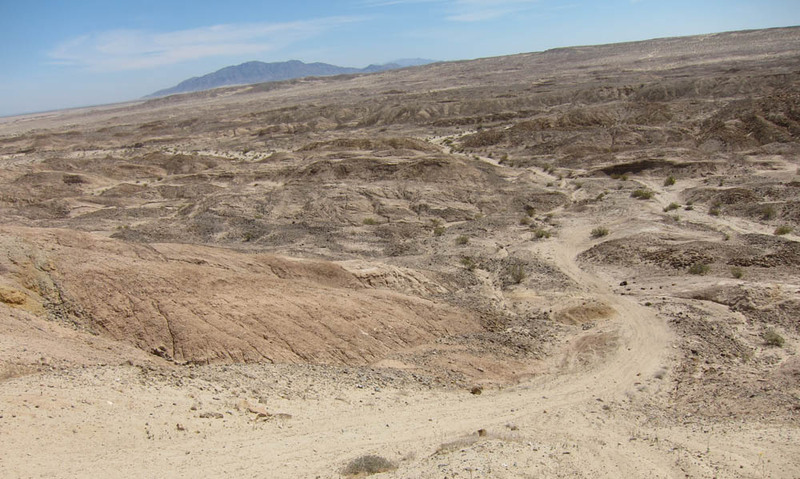 It takes attention to notice that the piedmont is not flat, but dips and rolls across its component alluvial fans, ultimately sloping to the Salton Sea, 230-feet below sea level. Unless you are driving through a monsoon cloudburst, overpasses span dry washes or if wet, irrigation canals. For those of us from temperate climes, rivers are often recognized by the swath of riparian vegetation snaking its way across the surrounding terrain. Recent research demonstrated (using a model with alfalfa sprouts!) that the riparian vegetation is a requisite component of a stream system that forms a classic meandering pattern upon the landscape. 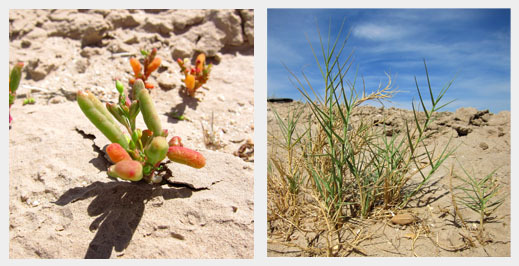 Due to the extended drought periods and saline soils, the washes are devoid of extensive riparian vegetation. This and the abundant gravel supply result in the streams having braided channels. Nothing calls out that there are rivers here. Those east-west highways are situated along the strips of high ground. The low relief of the piedmont masks that here, like elsewhere, the landscape is a mosaic of watersheds. The highways are largely following the watershed divides. But for Anza, who was travelling north-south and in desperate need of water, understanding the watersheds was key. The strips of high ground on which we zip by were treacherous barriers to the expeditions, for they were certain to have no water and poor pasturage. San Felipe Watershed. 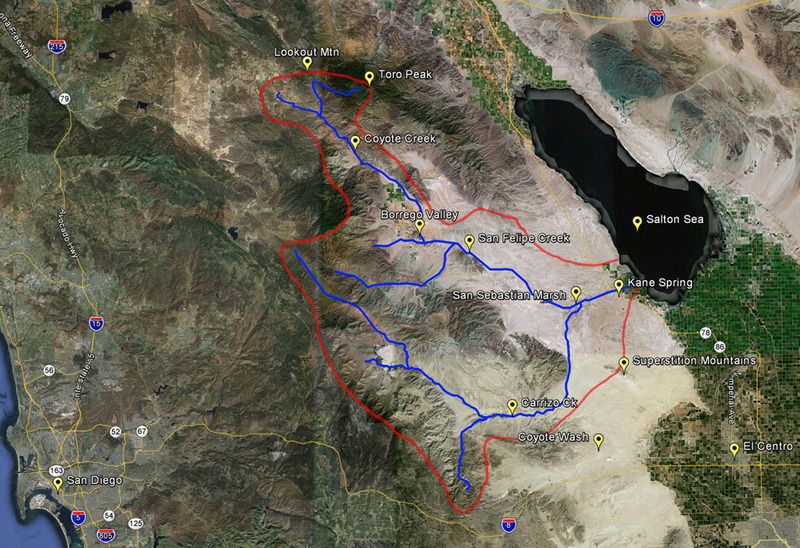 Blue lines are the creeks/arroyos; the red line outlines the watershed. Google Earth Image. Click to enlarge. So, what is here and what did Anza encounter? Moving north from the Yuha Basin the expeditions spent a night on Coyote Wash, then the rest of Anza’s desert journey was within the vast San Felipe watershed. It runs approximately 60-miles north-south from Toro Peak to Superstition Mountain, and covers about 1,500 square miles. It includes the Borrego, Carrizo, and Terwilliger Valleys. 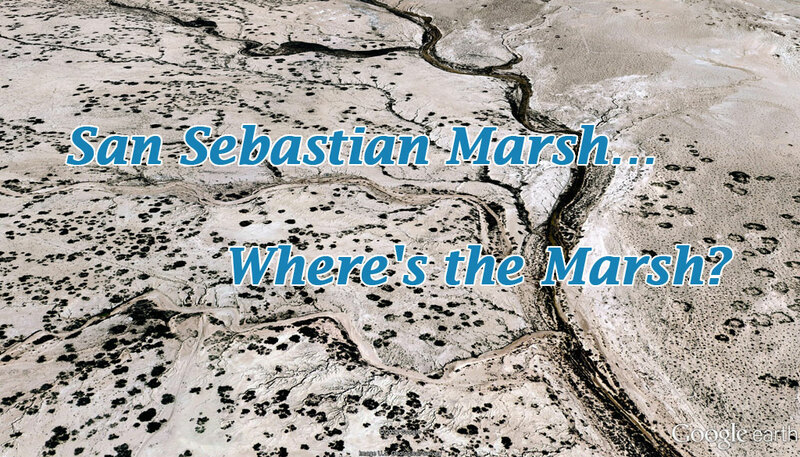 The heart of the system is known as San Sebastian Marsh where dozens of creeks come together before flowing on to the Salton Sea near Kane Springs. Besides their overall importance to wildlife, these riparian habitats and cienegas are critical to the survival of many rare, threatened, or endangered species recognized by the State and Federal governments. 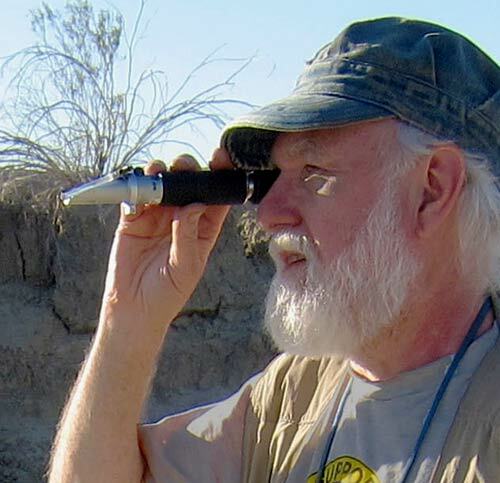 These include: desert pupfish, Peninsular bighorn sheep, least Bell’s vireo, yellowbilled cuckoo, Southwestern willow flycatcher, unarmored three-spined stickleback, black rail, and arroyo toad. Additionally, there are many species of special concern that inhabit these areas, including: yellow-breasted chat, yellow warbler, loggerhead shrike, Vaux’s swift, summer tanager, lowland leopard frog, California red-legged frog, Orcutt’s aster, and others.